Sync Folders. 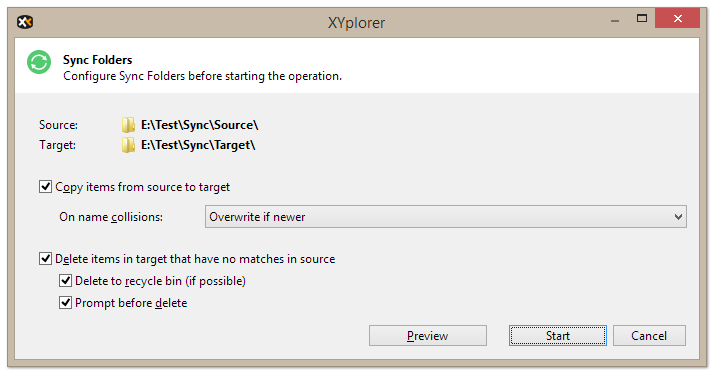 Finally XYplorer lets you synchronize two folders. It’s a one-way sync, also known as mirror sync: The target folder is made to be like the source folder. Now it’s just a toolbar button away. Advanced Users: Scripting support lets you create buttons or batches for frequently recurring sync tasks. Items that are only in source are copied to target. Items that are in source and target are overwritten in target. Items that are only in target are deleted from target. The Sync Folders configuration and start dialog. The dialog is shown each time before a Sync Folder operation is executed. Here you can control your parameters, make changes to the configuration, and run a Preview before going for the real thing. For quick mousy access there is also a toolbar button "Sync Folders". Use Tools | Customize Toolbar... (Ctrl+Shift+F9) to add it to your toolbar. Toolbar with Sync Folders button (the green one in the middle). For the details check out scripting command sync in the Help file. Sync Folders does not support Undo/Redo (just like Backup does not). Pretty obvious since overwriting is the core element of it and this cannot be undone. Read-only files to be deleted will be deleted without extra asking. Sync Folders can be backgrounded and queued (Configuration | File Operations | Background Processing | Enable background processing). BE CAREFUL! 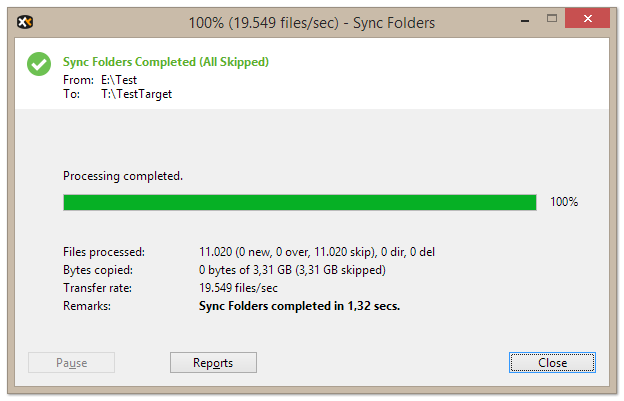 Sync Folders can really shake up the target folder. Time Stamping. 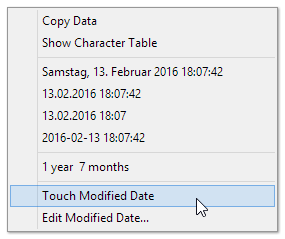 Now you can easily "touch" files (set the filetime to now) via the context menu. Of course, it also works in the Created and the Accessed column. Know Your Clipboard. The Paste toolbar button now shows what’s in the clipboard, i.e. the stuff that will be pasted if you click the button. Knowing what’s in the store. Backup Speed. Backup operations are much faster now when most items are skipped, which is the common case in large incremental backups. This would have taken about 8 times longer in the previous version. BTW, if you wonder about the 19,549 files/sec in the above screenshot: The total time of 1.32 secs includes not only the transfer but also the time needed to check 19,549 files in the target for possible deletion.